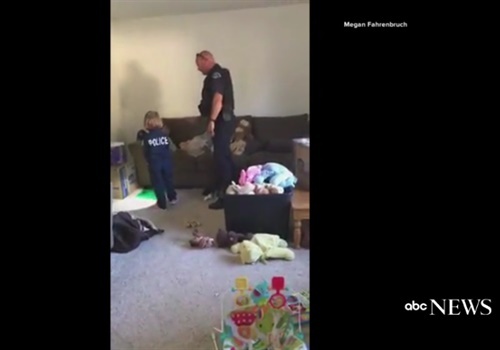 After meeting Longmont, CO, police Officer David Bonday at a community fundraiser, 4-year-old Sidney Fahrenbruch invited him over to her new house to check for any monsters that might be lurking there. "She was wearing a little police outfit," Officer Bonday, who has been on the force for 13 years, told ABC News. "She kind of attached to me." She and her mother, Megan, asked if he could drop by to "check the house before they moved in." "It was probably one of the cutest things I've ever been involved with as a police officer," said Officer Bonday, who has three children. Fahrenbruch met the officer in front of her home on July 23, before they went inside to look for the scary beasts. "She led me into the house and the monster hunting began," he quipped. Bonday let her use his flashlight to help him look for any monsters in the house. They didn't find any. But the girl, who wants to be a police officer someday, made a new friend.